SCOTTISH FIRST MINISTER Nicola Sturgeon is travelling to Brussels today for talks to defend Scotland’s place in the European Union after a vote by Britain as a whole to leave the bloc. 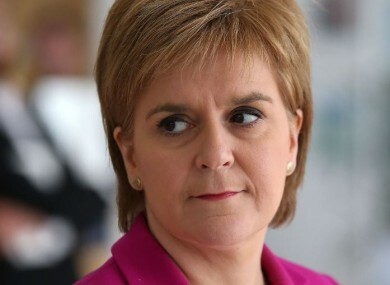 Sturgeon said she was “utterly determined” to protect Scotland as she obtained a formal mandate for direct talks with the European Union institutions at an emergency session of the Scottish parliament. “I will make an initial visit to Brussels to set out Scotland’s position and interests” to European Parliament leaders, Sturgeon said. “Through all of this I am determined, utterly determined, to preserve Scotland’s relationship and place within the EU,” Sturgeon, head of the pro-independence Scottish National Party (SNP), said. Britain as a whole voted by 52% to 48% to leave the EU but Scotland voted strongly for Britain to remain — by 62% to 38%. However, European Council President Donald Tusk has refused a meeting with the first minister, according to a source in the group of EU leaders. “Sturgeon requested a meeting with president Tusk, but Tusk thinks it’s not the appropriate moment,” the source said. Scotland is to draw up legislation for a new independence referendum to ensure it could be held during any negotiations for Britain to leave the EU, which would last a maximum of two years unless all EU member states agreed to extend them. Outgoing Prime Minister David Cameron has ruled Sturgeon’s initiative out, saying Scots had already voted against independence in 2014, and the referendum would require the authority of the British parliament to go ahead. “The last thing Scotland needs now is another divisive referendum,” his spokeswoman said earlier. But Sturgeon stressed the circumstances had changed since 2014 and Scotland was in “uncharted territory” and that a new referendum was now “highly likely”. Cameron will be excluded from a meeting of EU leaders in Brussels today as they discuss the Brexit fallout. Gibraltar, the rock outcrop on Spain’s southern tip that was ceded to Britain 300 years ago, also voted to remain within the EU and is seeking to stay in the bloc. “Technical experts” from both Scotland and Gibraltar are to meet to review the possibility of both remaining in the EU, according to a statement from Gibraltar. Sturgeon is due to meet European Parliament president Martin Schulz today, along with senior liberal MEP Guy Verhofstadt. Scottish SNP member of the European Parliament Alyn Smith called on it to stand by Scotland in an impassioned speech yesterday in which he described himself as “proudly European”. “Scotland did not let you down … Do not let Scotland down now,” Smith implored in a mix of French and English, bringing fellow MEPs to their feet in a standing ovation. Experts have said one way in which Scotland could remain in the EU would be if it became independent and then applied to be a “successor state”, effectively inheriting Britain’s EU membership. Email “Nicola Sturgeon on way to Brussels to defend Scotland's place in the EU”. Feedback on “Nicola Sturgeon on way to Brussels to defend Scotland's place in the EU”.